Shakespeare, Montaigne, and John Raymond Legrasse are quoted on the subject of evil. Richard Wentworth tells Commissioner Kirkpatrick that he’ll be enjoying a fine meal at the Cobalt Club while Kirkpatrick is accepting a lifetime achievement award from the Ladies Auxiliary. William Shakespeare and Michel de Montaigne were real people, but John Raymond Legrasse, from H.P. Lovecraft’s “The Call of Cthulhu,” is not. Henderson has chronicled Legrasse’s further exploits in a series of stories. The Cobalt Club is from the Shadow novels. Wentworth celebrates his birthday, allegedly his fortieth, early in the book. However, Wentworth was born in 1891, which would make this birthday actually his fifty-third. There is also a bonus story, “Lights, Camera, Murder!” by Rich Harvey. Ed Race, the Masked Marksman, investigates the sabotage of a film being made by a friend of his. A grimy storefront set reminds Race of old Doc Turner’s drugstore in Manhattan. 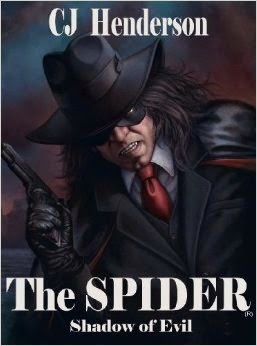 Race had his own series of stories by Emile C. Tepperman in The Spider pulp magazine. Doc Turner, a pharmacist and amateur detective, appeared in stories by Arthur Leo Zagat in the same magazine. Both Race and Turner encountered the Spider in 1934, as seen in Harvey’s story “One Death to a Customer,” bringing them both into the CU.